Meet Patrick, a self-proclaimed “party professional”: he can shove more cake into his mouth than anyone! When Patrick, his sister Evie, and his parents are invited to a wedding, his worried mom suggests they all practice for the big day. To do so, the family raids Patrick’s collection of stuffed animals and action figures. Evie and Dracula tie the knot while T-rex officiates. Thanks to Patrick and Evie’s newfound skills, the actual event is a smashing success! 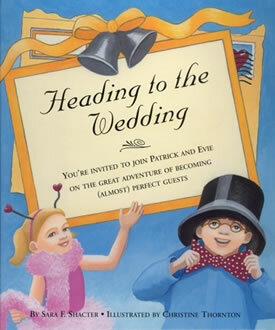 Book Secret: My early versions of Heading to the Wedding featured just Patrick. He had no sister. But once I added Evie, the book came to life in unexpected ways. That’s why revising is fun!